An indoor boat ride adventure into the world of Captain Jack Sparrow and his band of pirates. 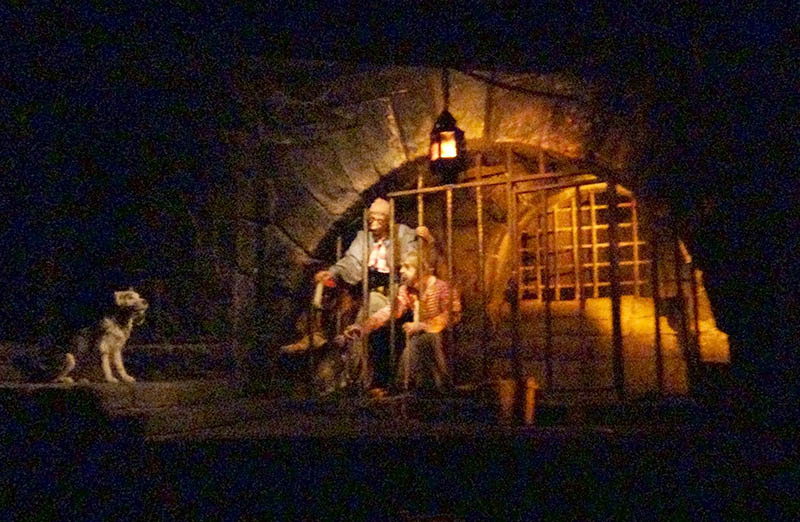 Disneyland's version of Pirates of the Caribbean was the last ride overseen during design and construction by Walt Disney himself. It takes riders by boat on a journey into a world of pirates, telling the story of their various exploits both aboard their ship and on land, where they terrorise local town dwellers. During the quarter of an hour boat ride, guests pass through scenes including a grotto featuring the bones of a long dead band of pirates; the middle of an aggressive battle on the high seas with cannonballs flying overhead between the pirate's galleon and a Spanish fort; the plundering and ultimate burning of a village; a jail where a group of pirates have been imprisioned; and finally a treasure room with a drunken Jack Sparrow sitting atop his new found fortune. Widely regarded as a classic Disneyland attraction, the ride inspired the popular Pirates of the Caribbean film series starring Johnny Depp as Captain Jack Sparrow. Disneyland's version of the ride has subsequently been adapted to feature the film's characters, including of course an audio-animatronic Johnny Depp.